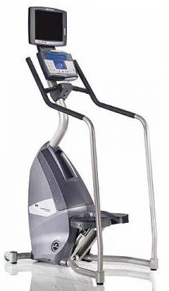 With a very small footprint, this stairclimber is a great spacesaver and a solid aerobic workout. The display screen, placed just below eye level for easy view, keeps track of your pace and stats. The handrails are ergonomically designed, with solid grips that won't let you slip even when sweaty. Pedals are designed for ultimate stepping comfort.